Mayan Name: I´X / Ix. Compatibility: Jaguar, Flint, Wind, Death, Dog. The Jaguar sign (Ix) is power, determination. The meaning of the sign is the jaguar, the ocelot, the magician. Patron - lunar deities Ichbalanque and Ichkhel. In the ancient Maya myths, the jaguar is one of the main totem animals, the personification of the Master of Hell, his element is night. In the Mayan calendar, the Jaguar Mark symbolizes dexterity, wisdom, cunning, perseverance. It is believed that people born on the day of the Jaguar are under his powerful protection, have magical abilities. 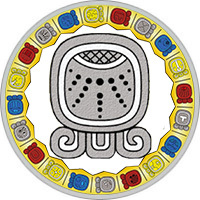 The Maya horoscope characterizes the people of the Jaguar sign as lucky dealers. Nature has awarded them with intuition, intelligence and cunning, which allows you to deftly avoid obstacles. The people of this day have a strong will and sharp mind. Fate gave them the role of "hunters", clearly set goals and objectives. No doubt, the "trophies" will be very good: wealth, a successful career, a strong family. And all this — the results of hard work, a strong will and faith in their own strength. Possess the ability to influence the minds of surrounding people, easily enthralled by their ideas. They often offer new, bold solutions, which is important — quite accurate, necessary at this time. According to the horoscope of the career, people of the Jaguar sign have a unique set of qualities: observation, curiosity, perseverance. Therefore, best of all, they are given work related to mental activity. Thanks to natural dexterity and ingenuity, they successfully carry out their ideas, possess an unsurpassed talent in concluding profitable deals. People of the Jaguar sign are excellent professionals, experts in their field: inventors, technicians, scientists, businessmen. But if desired, at the behest of the soul can take place in the creative sphere of activity, at least at the level of a hobby. For representatives of this sign there are no barriers, the protection of a strong predatory animal endows them with mystical powers. In a romantic relationship, the person of the Jaguar sign shows lightheadedness and impermanence. Too bright personality can not exist in a strict framework. Even in the heat of passion manifests power and selfishness, does not want to obey the will of the elect. Only a real feeling can change his attitude to life, make him soft and supple. The love horoscope characterizes the representatives of the Jaguar sign as demanding, narcissistic people. Often, these qualities, necessary for a successful career, are superfluous in personal relationships. Therefore, the ability to cede, understand the feelings and needs of a partner can have a positive impact on the fate of people of this day. According to the horoscope of Maya, the man of the Jaguar sign is the leader in all spheres of life. He does not doubt his own superiority, he considers it appropriate to give out valuable instructions. I am ready to accept someone else’s point of view, but in very rare cases, when the arguments can not be refuted. Self-confidence and arrogance are qualities that do not repel, but attract women to him. Sure, a strong man — a worthy partner for marriage, though too addictive, you need to constantly invent ways to keep his attention. A woman of the Jaguar sign is a beauty, a favorite of the society. According to her love horoscope she is destined to a happy fate. He has inner strength, magical abilities, a poet easily conquers the hearts of men. The representative of this day ignores misfortunes and sorrows, in all cases luck accompanies. But the reverse side of her luck is fragile health. Unfortunately, he often gets sick, even a slight cold easily suffers. Therefore, he carefully monitors his health, tries to play sports more.